“I don't much care where-“ said Alice. When setting goals for decluttering (or anything else for that matter), consider these simple steps. Walk through your home with pencil and paper in hand. Examine each room. Ask yourself which spaces are working and which ones aren't. The same questions can even apply to areas within a given space. Maybe the overall flow and feel of the room are fine but it isn't safe to open the closet! Once you've identified problem areas, figure out what’s causing them. Write down your findings. You can utilize the same exercise when it comes to setting goals to declutter your schedule or any other aspect of your life that feels chaotic. Identify the problems and the causes. Examine the information you gathered and set priorities. Which area will you tackle first and why? 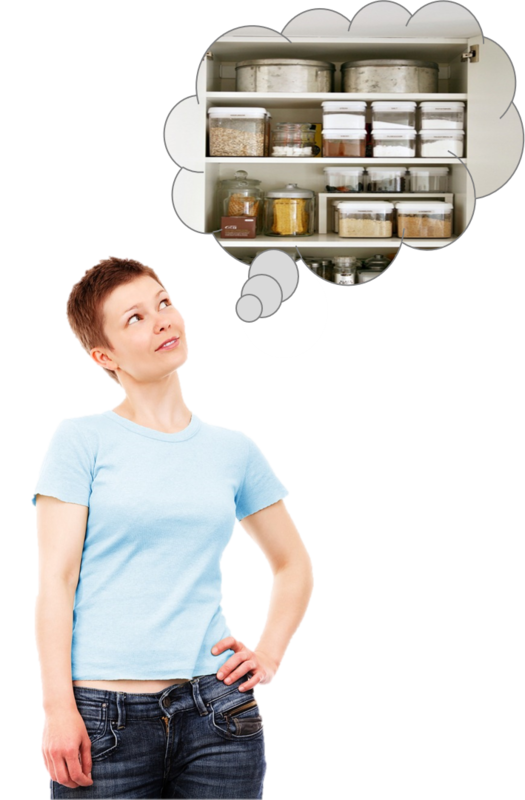 Is your kitchen so cluttered there is no room to cook? Are you embarrassed to invite guests over because all the surfaces in your living room are covered with stuff leaving nowhere for them to sit? Is the lack of storage in your bathroom driving you crazy? Are your closets bursting at the seams? These are the kinds of questions that will assist you in defining and setting goals that best meet your needs. While your overall aim may be to ‘get organized’, setting such a goal will not likely lead to success. You've got to narrow things down in order to achieve your aspiration. The more vague your goal the more likely you are to veer off course. Think back to step two. Use the priorities you identified to help you in setting goals that are specific. Break your goal down into manageable steps. To illustrate my point, let me ask you a question: How do you eat a whole elephant? The answer, of course, is one bite at a time. An elephant is surely an overwhelming thing to try and consume, but it could be done if broken down into small enough pieces and given an appropriate amount of time. The same is true for any big task – dividing it into smaller pieces makes it achievable. It also makes it easier to measure your progress. Short Term Goals are just that – goals which can be achieved in a short period of time (a day, a week, or a month at the most). Long Term Goals are goals which take longer to achieve – a semester, six months, a year, 5 years or more. Setting goals for the short term and achieving them can help to keep you motivated. Long term goals can give you a sense of purpose. If all your goals are long term, it can be difficult to measure progress and therefore easy to burn out. On the other hand, only setting short term goals will not likely give you as great a sense of accomplishment or help you define your desired end. It’s important to set both short and long term goals. Short term goals can and should help you in achieving your long term goals. For instance, let’s pretend that your goal is to organize your home office. Depending on the current state of your office, this could be a long or a short term goal. Let’s assume it’s a big job which is going to take some time making it more of a long term goal. It has been said (and with good reason) that a goal which is not written down is only a wish Writing your goal down is important. It makes the ambition real. It’s like a contract with yourself. Once it’s on paper, it’s out there for all to see – most importantly, for you to see and to be reminded. But it isn't enough just to write down your intent. You need to write down a plan for how you will achieve it. It’s not enough just to say “I want to declutter my bedroom”. How will you do it? What will it involve? 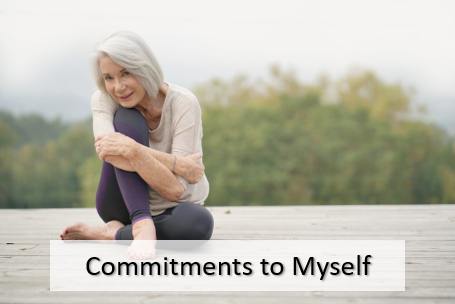 Taking the time to think through all that your goal entails will help you more clearly define your objective and establish realistic expectations for yourself. For instance, let’s use the example of the home office given already. The goal is to organize the home office in order to create a clutter-free, functional space that meets the needs of its occupants. The plan is to tackle the room in stages, one area at a time with a time table associated with each stage. Don’t just wish. Put your goals and your plan to achieve them in writing. Put a time limit on your goal. Setting a goal without a time frame in mind is a lot like making a wish. There is nothing to motivate you to get to work on your enterprise. It’s easy to make excuses and procrastinate because there is no deadline. When it comes to household organization projects, external motivators can sometimes provide good timelines for setting goals. For example, an annual clothing drive at the church might motivate you to clean out your closets and drawers. At the same time, it provides a time frame in which that goal must be achieved – before the clothing drive. Other events that make good motivators for getting organized include preparing for a move, having house guests, a neighborhood garage sale, or hosting a party or other event in your home.If you haven’t got a good excuse for decluttering in your immediate future, don’t let that stop you from taking the plunge! Create your own timeline for getting the job done and stick to it. The final step in setting goals is to get to work. You've identified and defined your specific goal. You've written out a thoughtful plan for achieving it and established a reasonable time frame in which to do so. Now you’re ready to put your plan into action. As you begin checking off easier, short term goals on your way to that more challenging long term goal, let those little successes serve as motivators to keep you focused on the final outcome. It’s important to consider the difficulty level when setting goals. You’ve heard the old adage “Don’t bite off more than you can chew”. A goal that is too difficult can quickly become discouraging and even frustrating. Breaking larger goals into smaller parts as described in the previous section can help you avoid this problem, as can varying the difficulty level. Easy Goals are important because they build good habits. Sharing your goal with someone you trust can prove helpful in a number of ways. For one thing, you establish a sense of accountability. Knowing that someone else knows you've set a goal, and will thereby know if you fail to achieve it, can be a true source of motivation. In addition, your trusted someone can, and most likely will, act as a cheerleader by providing encouragement and praise throughout the process. Maybe you know someone else who’s fighting the clutter battle. Enlist them in your cause. You can serve as a source of support for one another. You might even decide to work together taking turns helping one another. Many hands make light work! Besides, it’s always more fun with a friend. Once every week or so pause to evaluate your progress toward your goal. Pat yourself on the back if you’re on schedule and doing great. If not, don’t get discouraged. Maybe you just need to break your goal into more manageable steps or give yourself a little more time. Rather than giving up on your goal, rethink it instead. A little tweaking here and there can mean the difference between success and failure. Set yourself up for success! Rewards should be meaningful, something that makes you feel good and motivates you to keep working. Consumable rewards are preferable – a celebration dinner with your sweetheart or organizing buddy, a massage, a day out with friends – something memorable and enjoyable that doesn't take up space. Why? Because you’re trying to declutter! Giving yourself an excuse to bring more stuff into your home is not the best way to celebrate your organizing successes. But do celebrate – and often. You don’t have to wait until your 100% clutter free – rejoice in the journey. You deserve it. If you keep these steps and tips in mind when setting goals to declutter your home and life, you’re sure to succeed. 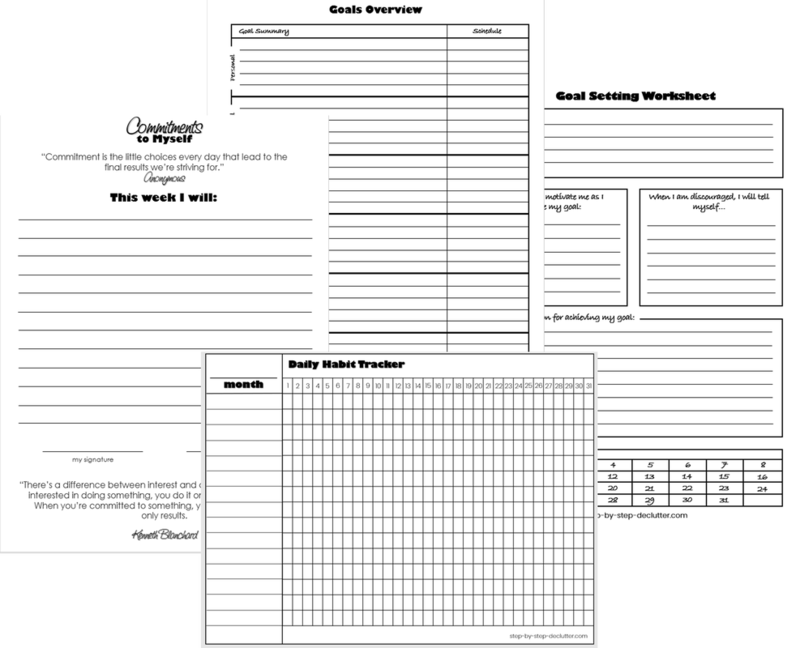 Click on the image below to gain access to my free printables library which includes a variety of pages to help with planning and executing goals.